James Cameron’s Titanic is regarded as one of the most successful films of all time. Titanic is an interesting piece of fiction to consider. Director James Cameron is hailed as a ‘hugely respected Titanic expert’. The film itself was, at the time, heralded as one of the most historically accurate versions of the ship ever to be put on the big screen, yet despite this, it is riddled with glaring inaccuracies. So how can it claim to be both fact and fiction at the same time? James Cameron has visited the wreck frequently, and the film’s depiction of the ship as a physical specimen is indeed historically accurate. The events that unfold upon the ship as it sinks and the characters involved, however, are twisted and dramatised until they bear no resemblance to what actually happened. Some characters and events are of course completely fictional, but this is where the problem arises. When the words ‘James Cameron’s Titanic is the most historically accurate Titanic film ever made’ appear they are rarely followed by the qualifier ‘but only in regards to the design specifications of the ship‘. Titanic as an accurate account of the sinking, when it is simply untrue. I don’t intend to nitpick and point out the minor issues, but I will focus on the gravest inaccuracies that have filtered into general acceptance and have the most damaging repercussions; namely the actions of the Titanic crew. 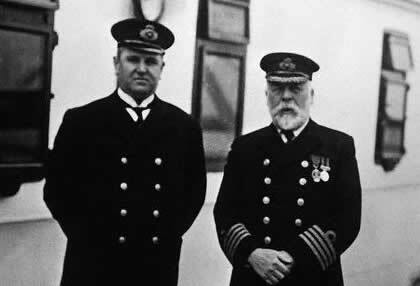 Captain Smith and First Officer Murdoch, both of whom went down with the ship. Titanic is, first and foremost, a love story; the fictional Jack and Rose fall in love against the backdrop of the disaster. Furthermore, we have the thinly veiled ‘American Dream’ metaphor prevailing over the stuffy, conservative and above all, elitist metaphor. The American boy from steerage shows the English rich-girl how to love, be free, live her dreams etc. Without exception, the English are shown to be the worst kind of aristocratic stereotypes, looking down on everyone around them, while arrogantly assuming themselves to be untouchable. However by presenting the English crew and passengers in this way, Cameron is then faced with a problem. Historically these morally unsound characters showed themselves to be heroic and fearless in the face of certain death, something which we cannot expect from his dramatised caricatures. Cameron chooses to ignore their actions as recorded in history and instead the bumbling Englishmen are shown to be just that; bumbling, inept fools who descend into chaos and panic the moment the ship begins to sink, unable to maintain order without resorting to shooting the passengers. This is so far from the truth it is insulting. Indeed, so offensive was the portrayal of First Officer William Murdoch to his surviving family, that the Vice President of Fox personally made the journey to Murdoch’s hometown to apologise and donate £5,000 to the William Murdoch memorial prize hosted at Murdoch’s local school. As well as suffering from general ineptitude, by dint of being English and the officer who failed to avoid the iceberg, Murdoch is also presented as a corrupt murderer and then a coward. After accepting a bribe to let a man onto one of the lifeboats he then shoots two passengers dead, before, overwhelmed with guilt and/or despair he shoots himself in the head. This is a far cry from the man who went down with the ship, his last moments spent filling the lifeboats with women, children and indeed men. In the DVD commentary Cameron justifies the decision to include this scene by saying that officers did fire shots to prevent passengers rushing the lifeboats. While an officer did fire two shots into the air to prevent a small group of Italian steerage passengers leaping into one of the boats, the officer in question was not Murdoch. He certainly did not kill anyone and there is nothing to suggest that he was bribed to allow men into the boats. On the contrary, Murdoch was one of the few officers who, in the absence of any willing women, allowed men into the lifeboats anyway. While Murdoch gains the most notoriety from the film, the other officers do not fare much better. Second Officer Charles Lightoller is shown to be so panic-stricken that he launches boats with hardly anyone in them, far below their capacity. It takes a stern admonishment from ship builder Thomas Andrews to convince the dismissive Lightoller to fill the boats, the suggestion being that he is holding back passengers, sending boats out with just a handful of people because of his fear and panic. Actually, the boats that were sent away half full was mostly due to the passengers themselves. So many of them simply could not grasp the seriousness of their situation that they preferred to remain on board Titanic, rather than brave the water in what they considered flimsy lifeboats. Lightoller emerged as one of the more heroic men on the ship. After the ship had sunk he gathered survivors from the water onto an overturned collapsible lifeboat. Under his direction the men balanced upon it until the Carpathia arrived four hours later. Lightoller went on to present evidence at the various inquiries into the disaster. The crew of the Titanic, most of whom went down with the ship, but in rather different circumstance. If Lightoller is presented as panicked, the Captain; Edward Smith can only be described as catatonic. After allowing himself to be pressured into exceeding safe speed limits by the ship designer, Bruce Ismay, the captain seems to have a type of mental breakdown when faced with the enormity of the situation. Lightoller has to suggest courses of action to which he numbly agrees, repeating what Lightoller says without any feeling or input. After being asked by a steerage woman with a baby where she could go to save herself and her child, he merely turns away and locks himself in his cabin waiting for death. The two are later seen in the water, presumably killed by the captain’s inaction. Again, historically Edward Smith filled the lifeboats until there were no more to be filled. Nobody is sure how he died, though there were rumours that he swam up to Lightoller’s overturned boat, placing a baby in the arms of a passenger before swimming away to his watery grave, wishing them luck. While this is probably just hero-worship it is far more believable than him simply giving up and leaving his crew to fend for themselves. And these are just the senior officers! Titanic had literally hundreds of crew aboard; stewards, stewardesses, engineers, firemen etc the majority of whom lost their lives aboard, ensuring that the passengers had the maximum chance of survival. Their stories are not told in Titanic where some of the most heroic actions that occurred aboard are omitted. 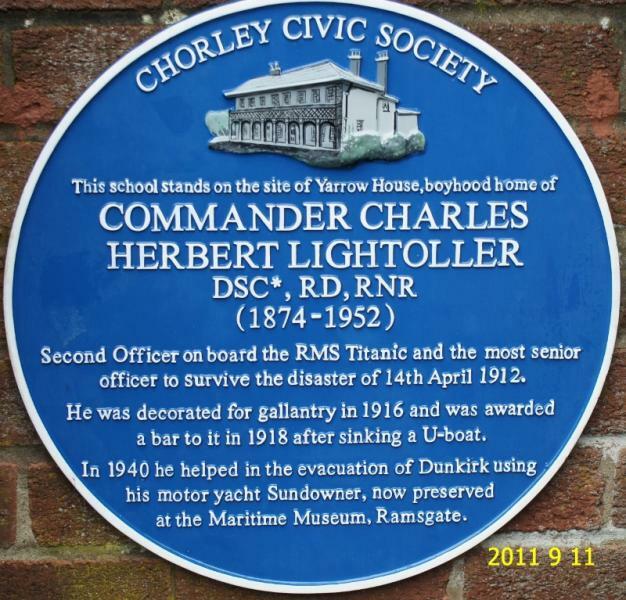 A blue plaque marking 2nd officer Lightoller’s childhood home. One of many such memorials that exist for the Titanic crew. Why is this then the most damaging of inaccuracies? The problem in this instance is that these men are hailed as heroes in their local communities and far more importantly by their families. These men and women are the subject of statues, memorials, streets and schools in their communities. We have already seen that Murdoch’s childhood school has a ‘William Murdoch Memorial Prize’ and this is far from uncommon. Further, the families of these people are still alive. How upsetting it must be to watch such a well received film and watch your uncle/aunt/grandfather/grandmother etc being traduced on screen. While there have been other fictional portrayals of the crew, as we can expect from such an historical event, none have been dramatised to the point of being unrecognisable as the heroic men and women who gave their lives to ensure the safety of as many passengers as possible. Indeed, it seems Cameron has created an incapable, fictional crew and simply given them the names of the actual officers, rather than portray any of them with the least modicum of respect. 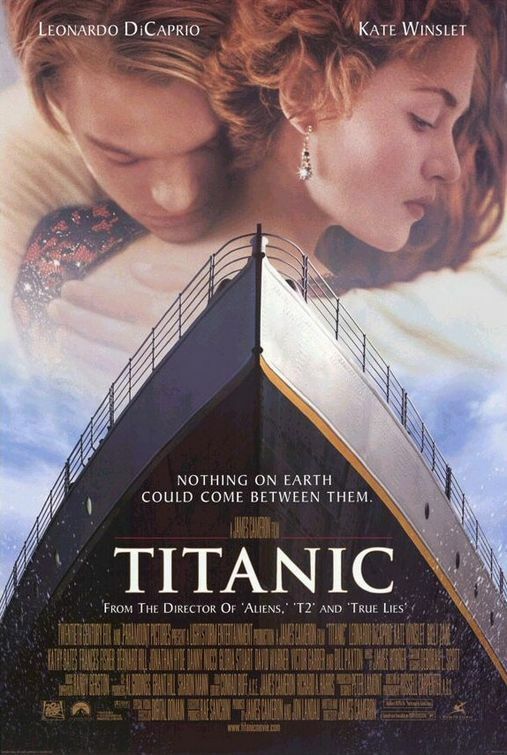 It is a shame that in an epic such as Titanic, which actually focuses more on the dramatic love between two make-believe characters it is the pomposity and ineptitude of the people tasked with their safety that people will happily fall upon as historical proof, given to them by an ‘expert’ claiming that it is at least in part, accurate. Hello! I have nominated your blog, which is amazing, for a Leibster Award! Please head over to my page and read over the requirements for you. Thanks! James Cameron’s Titanic is a Hollywood movie. I applaud JC for making a HUGELY successful film based on history and making it successfully. If the text “this is all 100% factually as it occurred” faded in at the beginning, I could see having a real issue with the film. Hollywood is a business and any business exists to make money. No studio would finance a 100% accurate bummer movie about an event that everyone knows the ending to. However having a love (albeit a love story that cannot occur in reality) story is a movie hook that will rack in the cash. I’ve read several articles about the historical inaccuracies of the film, but never see anyone mention the accurate aspects of the film- even little details like the chef drinking liquor (which possibly allowed him to survive). Or the gentlemen who decide to go down with the ship, although they supposedly were in a different location on the deck and not inside. You must remember that this is a “HOLLYWOOD movie” and the fact that he has used real stories and real accounts and somehow blended them into a Hollywood story is admirable. He had refrained from oversizing (aside from the fictional Rose’s room) aspects of the ship and the ship itself is highly accurate. This movie is supposed to entertain not to document. And the fact that he has so many little facts here and there and details that are true, is impressive. Of course there are aspects that are inaccurate. Mr. Andrews isn’t seen throwing chairs overboard to give people objects to cling to when the ship sank- but some people like me who have looked into the accurate details and know some accurate details- know them because the film did a good job of intriguing us. Yes some (a lot of culture) held onto the love aspect of the film and others (historians) forget that JC is a filmmaker not a professor doing a 100% accurate lecture. The love story is simply a hook to get the average (& let’s remember that American moviegoers aren’t the brightest bunch in the world) moviegoer interested in the film about a historical event that they would have otherwise had no interest in. For me the film got me very interested in the historical facts about the sinking of the ship. I admire that Cameron has called out some of his own historical faults in the film. Let’s remember that the ship was found in 84. Cameron began his research in 92. It’s very easy to hop on the net and criticize- but for Hollywood and the time in which he made the film- it’s impressive. Film is subjective. So it being “BASED” on history or not, there’s no right or wrong opinion. That’s what makes film and art so perfect. One persons treasure is another garbage. Also no studio in the wiled would finance a documentary film without an angle. And there were accounts of a deck officer possibly committing suicide- some could see this as Cameron saying Murdock WAS the officer who committed suicide, as a filmmaker and writer myself, I see it as Cameron being aware that something like that may have or could have happened and wanting to put it in the movie= you need a character to do it. It’s like a blender of actual history and Hollywood story and characters- you can’t please the historians/critics/filmgoers, you have to pick and choose and I like the job he did. Perhaps he picked the critics and moviegoers over the history buffs and historians more so- but he’ll, ya gotta make a film that you want to make and ya gotta pay the bills. Cameron is welcome to pick the critics and moviegoers over the history buffs to pay his bills, just as I am welcome to appeal to the history buffs and look at the history behind the film to pay mine. Again: that is the point of this blog. I get at least one comment a day from someone saying ‘it’s just a film chill out!’ I know it’s just a film, I know it’s just based on history, the point here is to show how much is history and how much is fiction. Also: “Film is subjective. So it being “BASED” on history or not, there’s no right or wrong opinion.” Indeed, but in this instance there’s also a little thing called fact. Just as an fyi to date I have had 147 Google searches for ‘did Murdock really kill himself’ or variations therein. As a filmmaker you might see it as Cameron trying to make us aware that someone might have killed themselves maybe, as a historian I’m answering the question: did this particular person kill himself? im watching this piece of dung right now..typical hollywood horse hockey. hackneyed plot, maudlin music, mediocre acting. the titanic was a horrible human blood sacrifice, not a touchy feelgood love romp. This is an awful film in every way. Total Hollywood horse hockey. FRC Blog » Hollywood and the Truth: Ships that Pass in the Night? This article instantly loses any respect for ‘historical accuracy’ when it blatantly shows a photograph of “The senior officers of The R.M.S Titanic” which is in fact the crew of Titanic’s sister ship Olympic. Cameron’s film is not pitched as a documentary, while this blog IS pitched as history… so how about getting YOUR facts right first? Otherwise it is simply an example of the pot calling the kettle black. 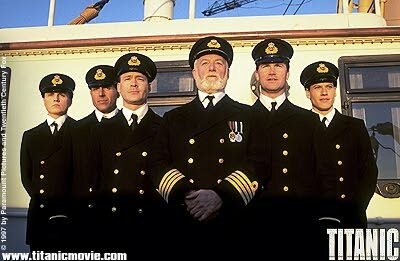 Thanks for pointing this out, my mistake, I’ve only seen that picture as an example of the Titanic’s crew. Problem solved. I get where you’re going with this article but pointing out historical inaccuracies and stating wrong facts in the same article makes me wonder how much of what you said is actually true. I’m by no means an expert but I do know that Astor was *not* crushed to death by a falling funnel, that’s just speculation that got picked up by a lot of historians without checking the source material. His body was recovered from the ocean in perfect condition so he most likely drowned. In fact no one actually knows how he died. Someone claimed they saw him on deck with W.T. Stead when the ship went down – if that’s true, that’s the last time he was seen alive. I do think you made an excellent point about Murdoch though. I’m not so sure about Lightoller though. I think these men were neither heros nor evil, they were people doing their best to save as many lives as possible and I think the film does portray that quite nicely – with the exception of Murdoch’s portrayal. I feel like Cameron wanted a villain and chose him without thinking it through. It’s fact that the crew wasn’t properly trained for the worst case scenario and that confusion and panic did make the evacuation harder because of this and I just think Cameron wanted to capture that. I also think that all changes were made deilberately. Cameron is an expert but as others have pointed out, he’s a film maker first and foremost. I do think he could have done better but I also think he did extremely well. I still like your article though, it’s well written and might help out some people who are interested in the real story after watching the film. Just thought I’d point out the Astor-thing. Thank you for pointing that out about Astor. At time of writing (which was a few years ago now) the theory was that he had been crushed. This was based on stories that his body had been recovered in a “mangled” condition and from eye witness accounts, specifically that of Gracie’s published experiences. I have corrected the article accordingly, as I’ve just seen a paper that talks about how the body was recovered without bruising which would support the idea that he wasn’t crushed. I don’t get much time to go back and update all the articles on the blog anymore. I’d disagree with you on the portrayal of the crew, I think the film deliberately shows them to be incompetent and inept rather than unprepared. I think the whole evacuation of the ship was portrayed better in the earlier 1953 film, which has a lot of fictional elements. So Mr. Murdoch is free to destroy a man’s reputation, based on what he “thinks” happened. Right. I have been studying the Titanic since I was a teenager. No ship’s officer shot any passengers & no ship’s officer committed suicide. Do the research on the subject the right way–do your homework. E.G., I have read a book on the Titanic published in 1913. None of the passengers interviewed says anything about anyone being shot or any officers committing suicide. And this is one year after the Titanic sank. Think the survivors’ memories were pretty good at that time? Wouldn’t they mention the shooting if it really happened? Is this in response to something else? At no point in the article do I say that someone got shot? In fact the article specifically says that this didn’t happen and that it was something made up for the film. Actually there are many accounts (at least 20) of a Titanic officer shooting passengers and then himself. Cameron was not just making this up, but in his dramatisation he had to choose one of the officers and so chose Murdoch, which in context is a logical choice, considering Murdoch was in charge of the ship during the collision and then in charge of the starboard evacuation. He had been just demoted from chief officer to first officer which meant loss of pay. He did not intend to portray him as a coward but more of a victim of circumstance. Actually there are many accounts of a shooting/suicide that began within hours of the sinking and range from private letters to newspaper accounts. A 1912 book on the sinking lists many accounts also. It is now commonly accepted that a Titanic officer most likely used his gun in those final moments on both passengers and then himself. The only mystery is the exact identify of that officer. When the movie is historically inaccurate, your comment is it either -at least in one point!You wrote: “It takes a stern admonishment from ship builder Thomas Andrews to convince the dismissive Lightoller to fill the boats, the suggestion being that he is holding back passengers, sending boats out with just a handful of people because of his fear and panic. Actually, the boats that were sent away half full was mostly due to the passengers themselves.” On a passenger ship, the officers are responsible for filling and lovering the lifeboats and so the officers are responsible for lovering the lifeboats only half full. In the testimonies of Lightoller and Lowe they both mentioned their fear of lovering the lifeboats full. Up to the end, Lightollers lifeboats werent full. Boat 4 left Titanic 1,55 AM, 65 seats, only around 30 people in it, Boat D (47 seats) with only 24 people in it. Lightoller never allowed men into the boats , even if there was room -except for Major Peuchen at Boat 6 of course. Murdoch instead first filled with woman and then – if space was left-with men. His starboard side was the only side were lifeboats ever were filled to capacity: Number 11, 13 and 15, many male passengers were rescued in this boats! Lightoller did the other, inhuman way! Result: The lowering of his boats costs more time, because woman had to be separated from their men. It is not too much to say: Lightoller is responsible for many male passengers death! Any questions about Lightollers “heroism”? I personally was excited rom the scene Andrews dismissing Lightoller. Finally a director has dared to show the truth! I don’t claim that lifeboats weren’t sent away half full, I say quite clearly that they were. The issue is one of motivation. The lifeboats were sent away half full because passengers refused to enter them and the officers failed to insist, a considerable difference to ineptitude and incompetence. Hindsight is a wonderful thing, had the officers (because it was not just Lightoller who turned away men) known the ship was sinking and rescue was not coming then they would have filled the boats to capacity. If the passengers had known the ship was unsafe they would have entered them gladly. Naturally it is easy for us to make these judgements, but of course at the time nobody believed the ship would actually sink. Again the issue is one of showing the crew as blustering and unable or unwilling to do their jobs which is Cameron’s “truth”. That Lightoller could have saved more lives had he not interpreted the captain’s orders so literally isn’t in denial,neither is the fact that he did save many lives through the night, most of whom were men.